Having fun with a Go-Pro. 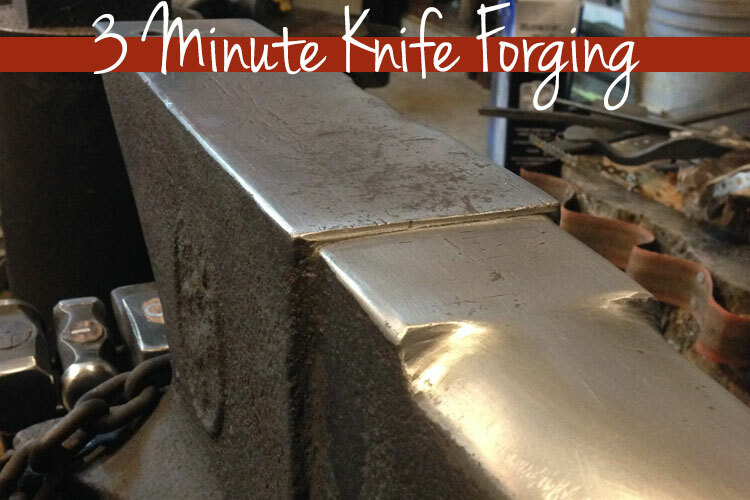 Here’s a 3 minute real-time video of me forging out a simple knife shape. The steel is 5/32″ x 1″ x 6″, 52100 bar. I cut it from the bar on a 45 deg angle to make forging the tip go a bit quicker. I hammered out 8 of these in under a 1/2 hour. My bud thought it would be a good idea to video the last one. Enjoy… and I dare you not to dance during the musical interlude. This entry was posted in Knives, Tutorials, Videos and tagged anvil, blacksmithing techniques, bladesmith, bladesmithing, Bush knife, knife, knife maker, Rick Marchand, smithing, Wildertools. Fantastic work Rick. I’m a long time collector and your “guppy” model trumps many ABS MS knives I own. Useable art. I just figured out how to reply to comments… lol…. only 2yrs… I’m a quick learner. Thanks for that compliment, Bill. It really means a lot to me. That is funny… “brain’s elevator muzak”… perfect! As for the question… Not always full tang. Sometimes hidden tang, sometimes through tang… occasional tapered stick tang… never rat tail.